Sometimes I time everything wrong. Tonight I let my boy eat the chocolate someone at nursery gave him at 6pm, we pissed about in the garden til gone 7, I let him watch TV until almost 8 in the secret hope that he would fall asleep on the sofa and the evening would be mine. He did not fall asleep on the sofa. Instead, he is a ball of angry toddler at the bottom of the stairs. He’s refusing to come up to the lovely bubbly bath I’ve run for him. It’s got your favourite toys. I say. Let’s have a nice bath time. We can play dinosaurs. My tone is getting pinched and I’m counting to 10 in my head. It’s not working. With threats and coaxing I get him up the stairs. He is beside himself. He wants his daddy. He doesn’t want a bath. He wants me to put his pyjamas on without going to get them, which would mean ‘leaving him’. He is all exhaustion and melodrama. By the time we make it to his room he is curled up in a ball. Tonight he’s not playing any games. When I try to manoeuvre him from a crooked position on a rocking stool to the bed he screams like I’m about to administer some form of medieval torture. I wrestle his pull-up on and let him go back to his crumpled position on the chair. It’s a foot from his perfectly good bed. But I just can’t. I tell him I going downstairs and will check on him soon, because I can feel that other me rising up. The one who snaps and yells at a tired three year old. The one I only show to the littlest, best person in my world. And it’s there he falls asleep. In the chair. No bath, no stories, no songs. Not even the chocolate brushed off his teeth. I put him into his bed and lather cream on a few spots I’m supposed to have washed in the-bath-that-was-not. And I feel glad that at least I got him into his pull-up. Firstly I’d like to big- up all mums. Birth mothers, adoptive mothers, foster mothers, grandmothers, great grandmothers, god mothers, people-who-aren’t-called-mothers-but-maternally-care-for-many-others. You all rock. But as I was lounging in bed this morning, being brought brekkie by my lovely Hubs (and Bubs who has no idea what day it is and just wants to eat my croissant) I realised that there were probably some Mothers Days when my mum didn’t get any of that. She was a single parent and when I was four-years-old I doubt I popped down the shops for a bouquet of a Sunday morning. Maybe other people did stuff for her. I imagine my Dad would have marked it in some way now and then (he’s lovely and they are together now so don’t go making assumptions #It’sComplicated). And she had some kickass friends who were totally my extended family growing up. (seriously guys, when my mum had tonsillitis and I was a baby they made a 24-hour rota and took care of use both, hurrah for friends!). 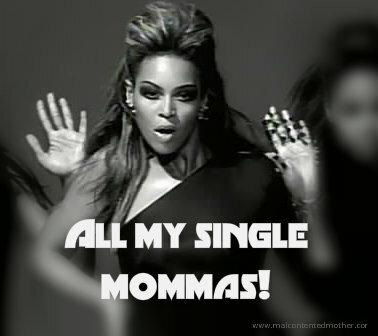 Still, we were lucky in ways that many single-parent families aren’t, so there must be a lot of women waking up this morning to no card, no flowers, no cup of tea. Just a hungry child and a pile of washing. 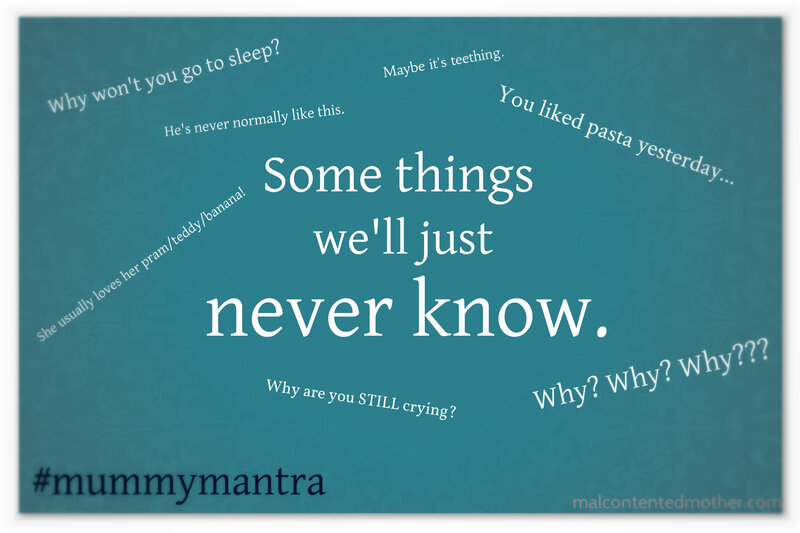 Mummy Mantra #5: Some things we’ll just never know. If you had to describe your parenting experience in 3 words would one of them be ‘unpredictable’? Do you find that whenever you detect and begin to ease into a pattern it suddenly changes again? It’s like as soon as you say anything out loud (e.g. ‘he has a really reliable nap in the mornings now’) it just stops happening. Mildly exacerbating, no? My previous mummy mantra was all about sleep. 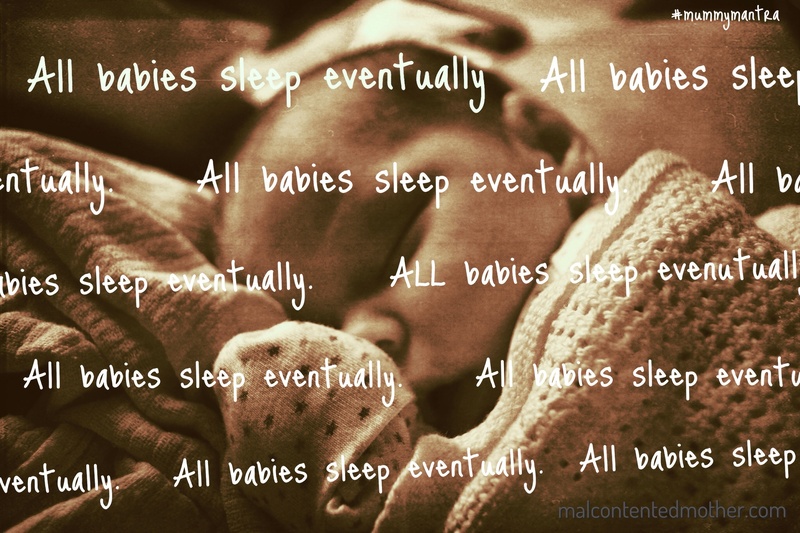 ‘All babies sleep eventually’. I did mention in that post that Bubs was sleeping pretty well these days. So, guess what happened that very night? Wakey wakey, mumsy!! What a fool I am! Now, this time I’m pretty sure I know why he’s waking. It’s the obligatory bi-monthly snuffly nose fortnight. He’s currently pulling of the snot-moustache look with some aplomb and I’m pretty sure it’s that that wakes him up. (Can I take this opportunity to thank Calpol for all it’s done for parent kind??) However, there have been other times when I’ve had no clue why, after 5 nights of sleeping through (aaah, sleeping through, those magical words) he suddenly decides that he needs two feeds a night again. Good one. How many times have you heard the phrase ‘it must be a growth spurt’ come out of your own mouth? 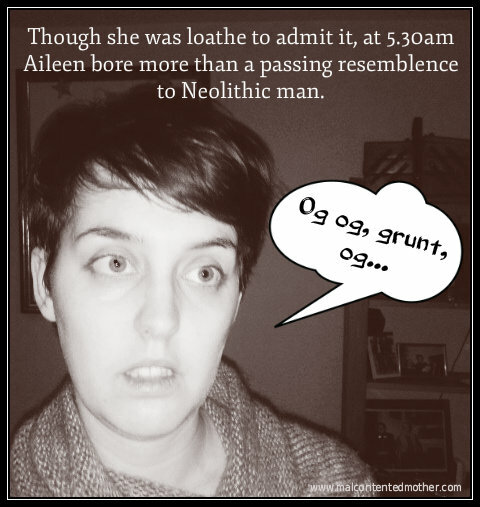 Or said ‘maybe she’s teething’? Or agreed with a friend over coffee that it must be a ‘developmental phase’ as they are ‘processing so much new information at the moment.’? I mean, there’s got to be an explanation. Riiiiight? In the modern era we are used to having our questions answered. Gone are the days of long drawn out debates in the pub over which actor played So-and-So in that Bond film, or which year it was that Channel 4 came on air. Nope, our pocket Google-machines have rendered all that unnecessary (other search engines are available). Even at work where we may face knottier conundrums there is usually, eventually, a satisfactory answer to whatever the problem is. 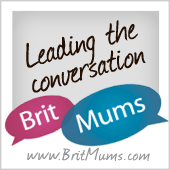 So, when faced with our baby’s crying/not eating/being hungry all the time/not sleeping/being in a right mood, it’s understandable that we think we should be get to the bottom of it all. The books (arg, those pesky bloody books again) encourage us to think that way. ‘How to soothe a crying baby’ promises the chapter title, followed by basically a ticklist – hungry? dirty nappy? tired? bored? etc. When we have exhausted these lists and our baby is emphatically not soothed it can be more than slightly disconcerting. ‘What had I missed?’ We ask ourselves. But, the truth that we all come to learn, Dear Reader, is that sometimes, we’ll just never know. By the time Bubs is old enough to explain why he was so screamy on that night back in February, or why one day he went from eating whatever I put in front of him to throwing most of it on the floor, he won’t remember. In fact, I’m not really sure he remembers now. Babies don’t work like that. As loving parents we all want to solve every problem our children will ever have. But we half of the time we won’t even understand what the problem is. We’ll just never know. A wise woman (OK, my therapist) said to me last week ‘you can’t solve an emotion’. Sometimes there’s nothing to solve, no question to answer. So we’ll just carry on trying out best. And that’ll be good enough. Promise.